On September 5, Consul General Hong Lei met with Illinois Governor Bruce Rauner at the Consulate General of China in Chicago. Deputy Consul General Liu Jun, Commercial Counselor Zou Xiaoming and Secretary of Illinois Economic Development Mark Peterson were also present. Consul General Hong Lei said that China welcomes Governor Rauner’s visit to China in mid-September. The fact that Governor Rauner has chosen China as one of the destinations of his first international visit reflects that Illinois highly values developmental cooperation with China. Currently, China continues to deepen and extend its efforts to reform and open up. Chinese economy maintains its momentum of stable, medium-high level growth. The upcoming 19th National Congress of the Communist Party of China will draw a clear blueprint for the future development of China. At the same time, the 19th Congress will create new opportunities for China-US cooperation. In this context, the Governor’s upcoming visit to China carries particular significance. Regional cooperation constitutes an important foundation of Sino-US relations. Consul General Hong said that China supports Chinese provinces and cities in strengthening their cooperation and exchanges with the state of Illinois, which would benefit people of the two nations. Consul General Hong Lei wished the Governor’s visit to China every success so as to promote the development of China-US relations, particularly elevate Illinois’ relations with China to a new height. 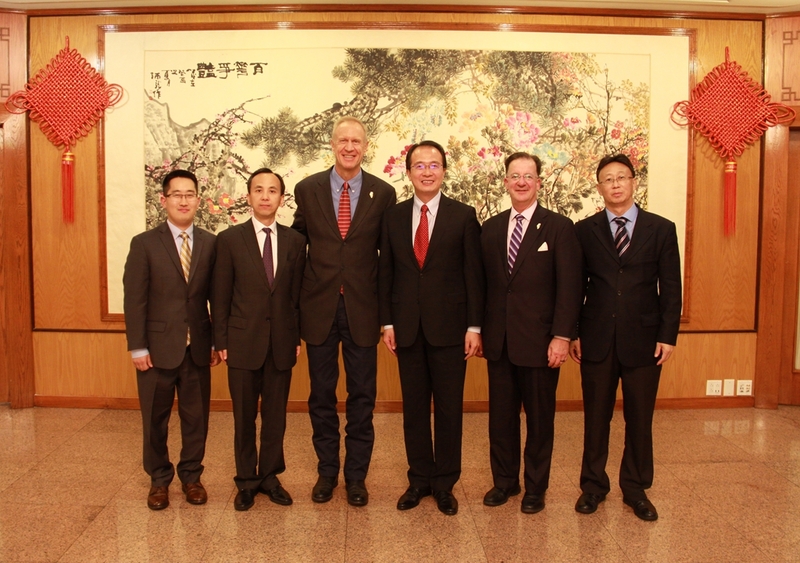 Governor Rauner expressed his gratitude for the Chinese side's effort in making thoughtful arrangement for his visit. The Governor said that Chinese economy is developing rapidly, and the large and educated workforce in China gives him great confidence in the prospect of Chinese economy as well as in US-China cooperation. He believes that China will be the most important partner for the US, expressing his support for Illinois companies in actively exploring cooperation with China. Governor Rauner also stated that he welcomes more Chinese firms to invest in Illinois. The Governor said he is looking forward to his visit to China in September, hoping that his visit would promote mutual understanding and Illinois’ cooperation with China's Zhenjiang Province and Shanghai Municipality in areas including trade, investment, education, and the humanities.